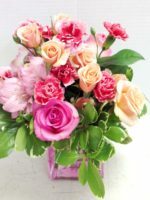 Flowers such as alstroemeria, mini carnations, statice, daisies and one red roses are sure to please the lucky lady who receives this great Happy Birthday In a Box gift from you! 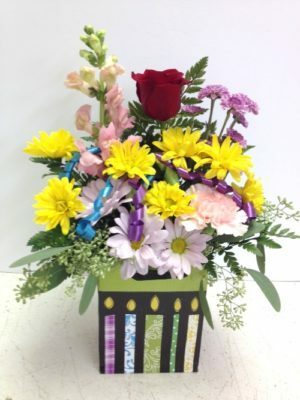 You can choose the colors and even the theme of the flowers if you call us at 602-246-1271. That’s because we are a REAL LOCAL FLOWER SHOP! Why Birthday in a Bag? I’ll tell you why! Many times a person is visiting the Phoenix area and staying in a hotel on their birthday. You know they’re going to be celebrating, and you’d like to add to the fun by sending fresh flowers. But you know they won’t be able to bring the vase or basket home, so you ask us to design Birthday in a Bag! It’s a great, bright, fresh floral arrangement in a disposable bag that they won’t feel bad leaving behind. 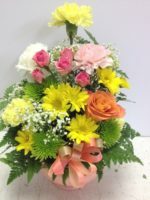 This is the perfect Happy Birthday gift for you to send to your mom, your aunt, your cousin, your daughter, your BFF or your SO, fresh flowers are designed low and tight in a Happy Birthday Bag for extra fun and cheer! Flowers such as alstroemeria, mini carnations, statice, daisies and red roses are sure to please the lucky lady who receives this great Happy Birthday Bag gift from you! Yes, we can design this for the man in your life! Simply call us and you can choose the colors and even the theme of the flowers if you call us at 602-246-1271. That’s because we are a REAL LOCAL FLOWER SHOP! What a great idea!! Let us design Birthday in a Bag for everyone you know! Flowers such as rose, daisies and snap dragons are festive and fun! The bag has lots of candles (but who’s counting?). You might prefer this Short and Sassy Birthday arrangement or a Happy Birthday Box! This is a Roadrunner Florist EXCLUSIVE! 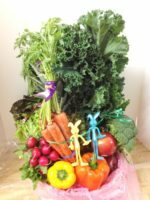 We can not guarantee another florist will have this great bag for delivery outside of our area.